Smartphones and tablets give you the freedom to access the Web from anywhere. But, mobile devices can easily be misplaced, or worse, stolen—putting all your personal Stuff at risk. Just imagine your information falling into the wrong hands. A stranger could spam everyone in your address book with unwanted calls and texts, post to your Facebook and Twitter accounts, make online purchases, and even steal money from your bank accounts. In short, your entire identity could be stolen from you.That’s why you need Norton Mobile Security—the powerful, Web-based service that lets you protect your smartphone and tablet with one convenient solution. Norton Mobile Security helps you recover your lost or stolen devices and prevent strangers from accessing the private Stuff on them. 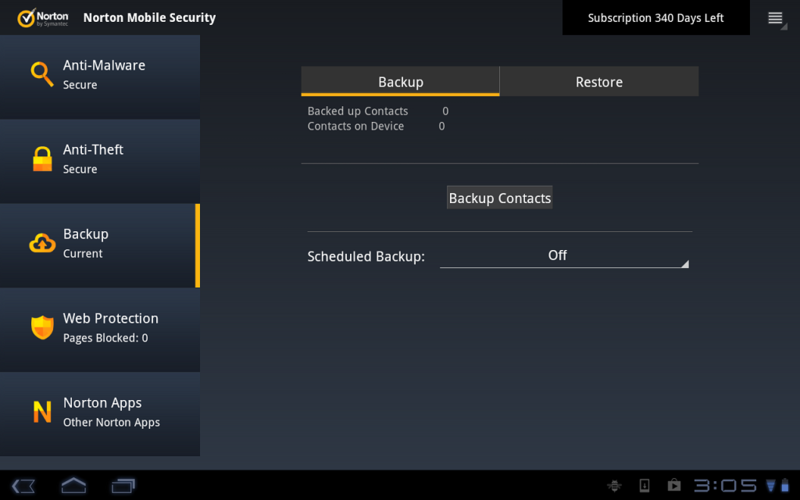 Norton Mobile Security protects your Android smartphones and tablets from theft, online threats and mobile spam. Lost or stolen device? 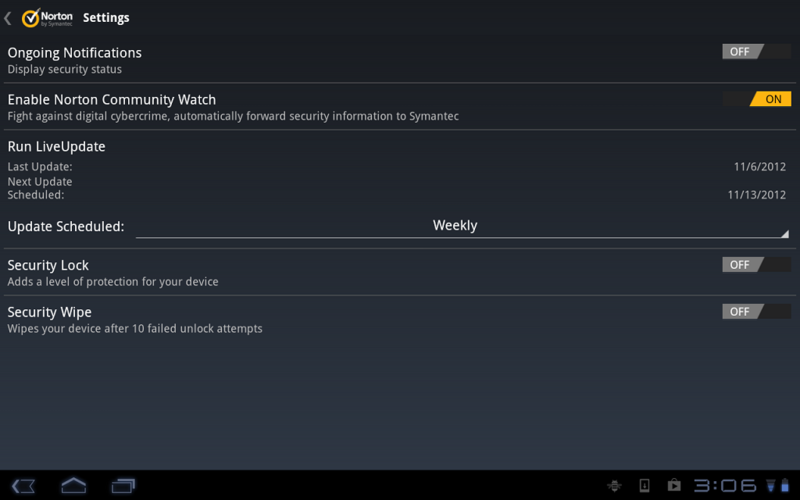 Remotely lock and locate it. You can even erase your Stuff, if necessary, to ensure your private information stays that way. Norton Mobile Security also identifies dangerous websites and scans downloaded apps, app updates, and SD (Secure Digital) memory cards to protect against threats. It stops viruses that can infect your phone and drive up your bill without you even knowing it. Protect what matters most in your mobile world with Norton Mobile Security—powerfully effective and convenient security for smartphones and tablets. Norton Mobile Security helps you protect what matters most in your mobile world with powerful, effective protection for Android smartphones and tablets. Missing device? Norton Mobile Security helps you find it fast. 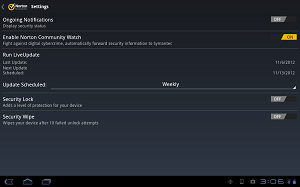 Worried about threats to your mobile device? We’ve got you covered with automatic protection from the latest mobile malware. 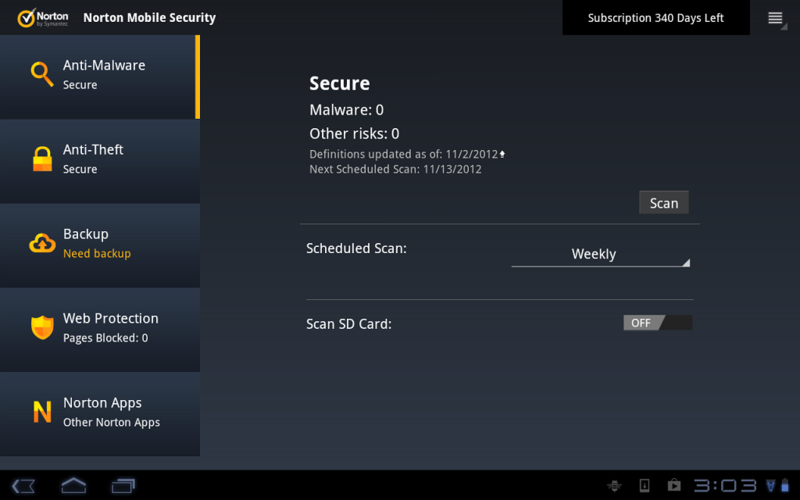 Best of all, Norton Mobile Security lets you do all this—and more—from one convenient, easy-to-use website. Secure all of your mobile devices from one convenient website. Protects Android smartphones and tablets. Remotely lock lost or stolen smartphones and tablets through our secure website, so strangers can’t use them or access your information. Erase the information on your device, if necessary, so your private information stays that way. Shows you the location of your missing device on a map to help you find it fast. When in “lost mode,” it uses the built-in webcam to take a photo of anyone using your device (webcam-enabled devices only). Protects against viruses, malware, and other mobile threats. 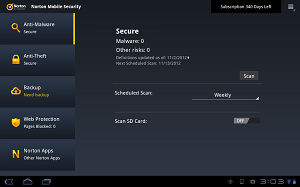 Automatically scans downloaded apps and app updates for threats and gets rid of them. “Scream” Locator: Sets off a “scream” alarm, so you can quickly find your missing mobile device. Remote Lock: Locks a lost or stolen phone or tablet to prevent strangers from using it and seeing anything that’s stored on it. 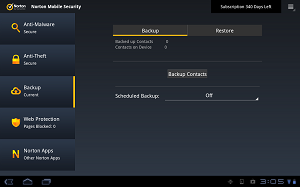 Remote Wipe: Lets you erase the information on your missing mobile device, including any data on phone memory cards. Sneak Peek: Uses the built-in webcam to take a photo of anyone using your device once you list it lost or stolen (webcam-enabled devices only). Call & Text Blocker: Lets you block calls and text messages from specific phone numbers or anonymous or unknown numbers (phone only). Download Threat Protection: Checks your apps and app updates for threats and removes them without slowing down your device. Go explore the great on..